Promotional items, giveaways, tchotchkes – whatever your word of choice, I’m referring to the cheap , *ahem, inexpensive, items we put our company name on in hopes to further impress our brand upon the subconscious of all who are in our market space. One company distributed individually wrapped mints featuring their logo. The downside was the static riddled wrappers inevitably missed the waste cans leading to quite a number of wrappers strewn about the booth and in the aisles. Interestingly enough they all seemed to land logo side up. I’m not sure if the brand being featured as garbage was really the outcome their Marketing Maven would have desired, but it was sure a neat trick that even many aisles over, this particular company had a brand presence. Some shows rely so heavily on these types of giveaways that when I come across a company who doesn’t hand out anything, my first thought is, “Who’s the Grinch?” On the flip side, I have walked an entire show so devoid of such fluff that finding a decent pen was irritatingly impossible. Companies within the same industry and with the very same customer-base all have different philosophies, at least in the industrial world. It seems to come down to the personality of those making the decisions rather than being based on a ROI or actual brand positioning decision. So what are you as the Marketing Maven supposed to do? Do you heavily promote your logo on post-its, flashlights, or the swine-flu inspired hand-sanitizer bottles? Or, do you reserve your marketing dollars for shirts and more customized gifts for actual customers who participate in a survey or drawing? I’d like to tell you to save your marketing dollars, but my experiences point to a decidedly different conclusion. Although we sometimes question whether or not simple pens, pads of paper and show bags will serve as an impetus for a future buying decision, giveaways are so entrenched in our expectations that if we forgo them, we may miss out on another way to connect with our customer. Case in point – On the very last day of a show I found myself alone in the booth as my colleagues went to lunch. A gentleman stopped by and asked expectantly if we had any of our gizmos left. I told him no, we were out, but we had something better and I offered several of those. I was very upbeat since what was on the table was a higher caliber of giveaway and not nearly as cheesy as the item he was seeking. He politely declined my offer and repeated his request as if I had lied to him. Not fully comprehending the situation, I explained again, that we had given out the last of the plastic gizmos, but we had plenty of these better quality thing-a-ma-gigs. The item he was declining was actually useful, while the cheap alternative was the cereal-box version of what we now had, so I couldn’t wrap my head around his persistence or his disappointment. He didn’t leave. It will forever remain as one of the more bizarre tradeshow memories for me as I witnessed this grown man utterly rejecting something that was actually useful because he wanted the cheap plastic Cracker-Jack alternative. I had nothing to offer, I stood there a bit dumbfounded as the man looked as if he was about to cry. An exhibitor across the aisle heard our exchange and graciously offered crying man his plastic gizmo he had picked up from our booth the day before. Crying man was more delighted than was logical – or normal. I still haven’t figured out why professional adults become concerned with possessing an object with no apparent functional or even aesthetic value. 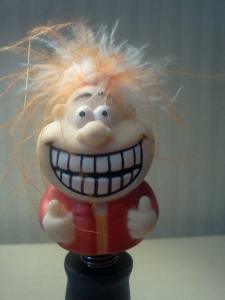 At least my bug-eyed, toothy-grinned, troll-haired, half-man-on- a- spring pen, who yells, “Thanks a lot! Thank you very, very much, Thank you sooo much!” serves an actual purpose . . . it makes me laugh. There must have been some childhood memory, some desire to pull a prank on a co-worker or some other creative use crying man had for a cheesy, ill-manufactured plastic gizmo for which I’ll never understand. What I do understand is that there will always be the need for a replacement pen and whether or not there is any actual monetary return for a company in passing these little things out, one thing is very certain in my mind; tradeshows would be far less interesting and marketing departments across the globe would be less creative if we weren’t forever having to one-better the competition or needing to trump last year’s wildly in-demand show bag with cup holder.